We look at them all anew after a visit to Turin-born photographer Piero Mollica’s exhibition Coincidences in the Quartiere via della Rocca, close to the River Po. 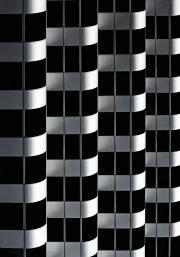 At the bijou Galleria Riccardo Costantini, the simplest of settings compliments Mollica’s sharp, shiny transformations of modern architecture from around the world into abstract art with the focus on the patterns made by windows and other aspects of construction. Rather than being home to human activity or recognisable shapes, buildings become rhythmic geometry and the people who inhabit them shrink from view. Most of the constructions appear impenetrable, as the forbidding facades of city life, with windows more like mirrors than apertures. A work entitled Think Different, after Apple’s slogan, is an exception. It zooms in on Post-it’s San Francisco offices, whose windows are human and different rather than rendered uniform and abstract. The blinds are fully closed, askew or half way up and revealing a pattern of Post-it notes. In Paris, Mollica’s focus reverts to the more or less pure abstraction that is central to this exhibition. From the Arab World Institute’s jagged angles, he creates a giant “French Y”, which is the title of the photograph. On the outskirts of Tel Aviv, a detail of the Design Museum at Holon, by contrast to the slick black and grey of the Arab World Institute, is all about warm brown curves, chilled slightly by their juxtaposition to concrete-grey. In Berlin and San Francisco alike, Mollica makes high-rise blocks appear to be folds of material or wallpaper, while Hong Kong’s sky-scrapers shimmer and curve like giant women in clear, Asian light. None of it is reassuring. Rather, it’s an immaculate and valid response to the increasingly artificial and superhuman scale of city life. London Grip Poetry Review – Wai Keung	Woman Before A Glass. Review by Julia Pascal.